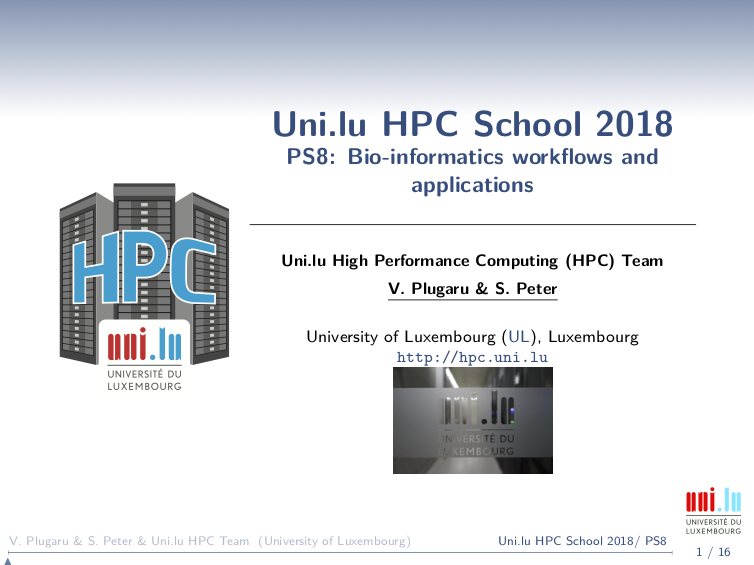 The objective of this tutorial is to exemplify the execution of several Bioinformatics packages on top of the UL HPC platform. ABySS is a de novo, parallel, paired-end sequence assembler that is designed for short reads. The single-processor version is useful for assembling genomes up to 100 Mbases in size. The parallel version is implemented using MPI and is capable of assembling larger genomes [*]. This example will be ran in an interactive session, with batch-mode executions being proposed later on as exercises. In the ABySS package only the ABYSS-P application is parallelized using MPI and can be run on several cores (and across several nodes) using the abyss-pe launcher. Question: Why do we use the -x VARIABLE parameters for mpirun? On Gaia, we can also connect to the job (recall oarsub -C $JOBID) from a different terminal or Screen window and see the different ABySS phases with htop. Because the abyss-pe workflow (pipeline) includes several processing steps with different applications of which only ABYSS-P is MPI-parallel, the speedup obtained by using more than one node will be limited to ABYSS-P's execution. Several of the other applications that are part of the processing stages are however parallelized using OpenMP and pthreads and will thus take advantage of the cores available on the node where abyss-pe was started. The used input dataset is a well known Illumina run of E. coli. GROMACS is a versatile package to perform molecular dynamics, i.e. simulate the Newtonian equations of motion for systems with hundreds to millions of particles. It is primarily designed for biochemical molecules like proteins, lipids and nucleic acids that have a lot of complicated bonded interactions, but since GROMACS is extremely fast at calculating the nonbonded interactions (that usually dominate simulations) many groups are also using it for research on non-biological systems, e.g. polymers [*]. We notice here that we are running gmx_mpi in parallel with mpirun/srun on 12/14 cores, and we explicitly export the OMP_NUM_THREADS variable to any remote node such that only one thread per MPI process will be created. Question: What will happen if we do not set the number of OpenMP threads to 1? GROMACS has many parallelization options and several parameters can be tuned to give you better performance depending on your workflow, see the references in the last section of this tutorial. The used input corresponds to the Ribonuclease S-peptide example, which has been changed to perform 50k steps in the Molecular Dynamics run with position restraints on the peptide. Bowtie 2 is an ultrafast and memory-efficient tool for aligning sequencing reads to long reference sequences. It is particularly good at aligning reads of about 50 up to 100s or 1,000s of characters, and particularly good at aligning to relatively long (e.g. mammalian) genomes [*]. TopHat is a program that aligns RNA-Seq reads to a genome in order to identify exon-exon splice junctions. It is built on the ultrafast short read mapping program Bowtie [*]. This example will show you how to use the latest version of TopHat in conjunction with the latest Bowtie2, by using the versions prebuilt for Linux by the developers. (node)$> cd samtools-1.8 && ./configure && make && cd ..
We can see that for this fast execution, increasing the number of threads does not improve the calculation time due to the relatively high overhead of thread creation. Note that TopHat / Bowtie are not MPI applications and as such can take advantage of at most one compute node. Next, we will make a longer test, where it will be interesting to monitor the TopHat pipeline (with htop for example) to see the transitions between the serial and parallel stages (left as an exercise). The input data for the first test corresponds to the TopHat test set, while the second test is an example of aligning reads to the chromosome 10 of the human genome as given here. mpiBLAST is a freely available, open-source, parallel implementation of NCBI BLAST. By efficiently utilizing distributed computational resources through database fragmentation, query segmentation, intelligent scheduling, and parallel I/O, mpiBLAST improves NCBI BLAST performance by several orders of magnitude while scaling to hundreds of processors [*]. mpiBLAST requires access to NCBI substitution matrices and pre-formatted BLAST databases. For the purposes of this tutorial, a FASTA (NR) database has been formatted and split into 12 fragments, enabling the parallel alignment of a query against the database. A .ncbirc file containing the paths to the necessary data files can be downloaded from here and placed in your $HOME directory (make sure to backup an existing $HOME/.ncbirc before overwriting it with the one in this tutorial). Question: Knowing that the databases can take tens of gigabytes, what is an appropriate storage location for them on the clusters? We will run a test using mpiBLAST. Note that mpiBLAST requires running with at least 3 processes, 2 dedicated for scheduling tasks and coordinating file output, with the additional processes performing the search.